Here's a neat thing I just read about; the brown dwarf LSR J1835+3259 has an ultra-bright aurora around a million times brighter than Earth's. They're not sure why yet because the brown dwarf doesn't have a companion star that would normally be the source of energetic particles that cause aurorae, but one of the speculated causes is an Earth-sized planet orbiting the brown dwarf interacting with its magnetic field in a similar manner to how Io does with Jupiter. So, a couple of neat phenomena are described in this article that could suggest some things to add to Space Engine. 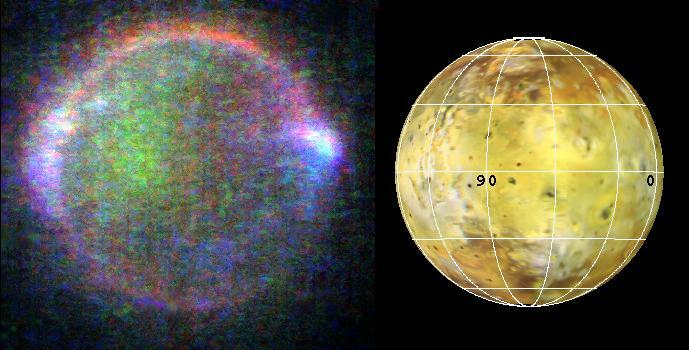 Planets and moons like Io can fill a magnetic field with charged particles suitable for creating aurorae. I suspect that currently planets are given aurorae based on random chance, but someday it'll probably make sense to consider the planet's environment when determining whether they get them. Aurora colour depends on the composition of the atmosphere. Kind of a separate issue, but I was reminded of it because it was mentioned in here. Space Engine doesn't currently give a real composition to atmospheres but maybe someday. Anyway. Would add some variety to brown dwarfs if some of them had spectacular displays like this. I find this quite spectacular as not to be in SE. We held a similar discussion here: http://en.spaceengine.org/forum/8-2316-1 There are some ideas if you are interested. We held a similar discussion here: http://en.spaceengine.org/forum/8-2316-1 There are some ideas if you are interested. That would be quite pretty, indeed. Do you know of any papers that have been published regarding the possibility of visible light emissions from radiation belts like this? I was tempted to mention something about how Io spews out interesting streams of charged particles and how that might be visible under some extreme circumstances in this post, but I didn't want to stray too far into speculation since Space Engine tries to be realism-focused. Aurorae on planets with multi-polar magnetic fields (for example, Mars has only small localized magnetic fields "frozen" from back in the day when it had a global field, and it's thought that when Earth is undergoing a magnetic field reversal its magnetic field breaks up into a chaotic patchwork for a while too). This would only require modification of the existing aurora shader to allow for more complex shapes than the existing squiggly circles. Phosphorescence in surface minerals on airless worlds that are subject to high radiation environments. I once saw some artwork depicting a surface view on a pulsar planet and the terrain was glowing in patches and streaks from the intense radiation bombardment, I imagine it'd be really beautiful to see those glows shifting and flickering like an aurora does. Didn't have any articles at my fingertips for those, though. Do you know of any papers that have been published regarding the possibility of visible light emissions from radiation belts like this? I didn't find any documentation about this, it was just a wild speculation. The Universe is inmense, maybe things like this appear in some places if it is possible for some concrete circumstances. I think visible plasma emissions from exoplanets is not something well studied maybe because of the lack of scientific interest on something that specific by now. But maybe someone could make the calculations and see if this is reasonably rigorous. Maybe a plasma trapped in the radiation belts can't be visible because it would never get so dense (maybe there could be an accumulation mechanism) or so hot as to glow in the visible range, or maybe yes, I don't know. Exotic worlds have to be taken into account but always with realism as you said (the greatness of Space Engine is the reliability of those depictions). The glow comes from charged particles in the radiation belt of Jupiter smashing the surface and atmosphere of this body. The green glow corresponds to sodium, red from oxigen and the blue glow comes from the interaction with volcanic gases. If Jupiter had a gaseous belt in the same region wouldn't it glow like Io? or it's unstable? By now we can only assure that Io lights up because of this phenomena. It would be an awesome feature for Space Engine. Martian auroras are visible in the UV frequencies because of the atmospheric composition of the planet but indeed I found very important to add those strange auroral structures on Space Engine to show multipolar magnetic fields on alien planets. Maybe an extremely magnetized mountain could have its own auroral structure in the skies. Phosphorescence in surface minerals on airless worlds that are subject to high radiation environments. Auroras aside, would brown dwarfs emit any kind of visible at all due to their internal heat, as in the way a coal glows red under its ash? I need to know because I am working on a space art painting -- yes, with actual paint instead of digital. None of the astronomers at the university where I work have been able or willing to respond to this question. I know that brown dwarfs are often depicted as bright red, but I'm thinking it would look cool if they have Jupiter-like clouds dimly lit from within with a ruddy glow showing through the spaces between the clouds or storm systems. Does anyone know? Are they strictly infrared or could we see them with our own eyes if we were in the vicinity? Brown dwarfs do indeed glow naked-eye visible orange or red from their internal heat. Some of them, anyway. Brown dwarfs come in a wide range of temperatures and the coolest ones are just a few hundred degrees, cold enough that they're probably dark to the human eye. And the hottest brown dwarfs are actually about as hot as a red dwarf, so they'd look a lot like a "real" star at that end. I think what you're looking for is the middle range, where the brown dwarf is hot enough to be glowing but cool enough that it can have high-altitude clouds of solid or liquid particles. here's an artist's conception of a T-class brown dwarf that falls in that range, along with some discussion of the sorts of clouds and "weather" that might be found on such stars. ^Excellent! Thanks so much, Astronaut! It's amazing what simple facts slip by us just because they may seem too obvious to mention, so I've been looking a very long time for this information. As icing on the cake I'm going to give my brown dwarf some kind of accretion disk or maybe a ring system, also lit from within. And brown dwarf aurorae appear to be in for the next verison. Yay!